I have a lot of salsa music files in my iTunes. I got a lot of these files from a few DJ friends of mine, but when I ran beatunes, it did not detect the BPM for these songs. 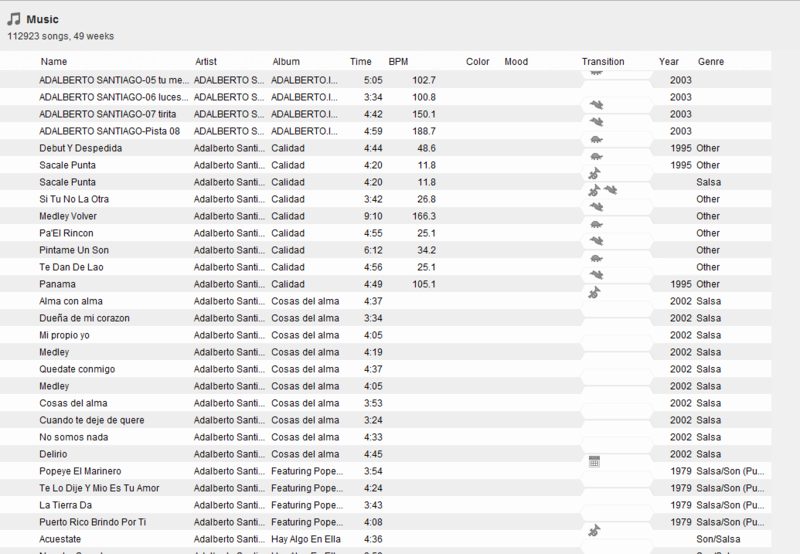 it did not detect the BPM for these songs. Did not detect any BPM or did detect them wrong? If no BPM were detected at all, did beaTunes show any error messages? No error message Showing and it detected some but not others. Any errors would be shown in the Analysis view (accessible via the vertical button on the left). Can you please select a bunch of those songs that don't have a BPM value, select Analyze from the File menu, and analyze them again for BPM. If beaTunes does not switch automatically to the Analysis view, please click on that vertical Analysis button. If not, are the BPM now present? I did as instructed but was given the following error messages. - Could not find any tags for 'Alma con alma'. - Could not find any tags for 'Dueña de mi corazon'. - Could not find any tags for 'Mi propio yo'. - Could not find any tags for 'Medley'. - Could not find any tags for 'Quedate conmigo'. - Could not find any tags for 'Cosas del alma'. character (<) at position 0. - Could not find any tags for 'Cuando te deje de quere'. - Could not find any tags for 'No somos nada'. - Could not find any tags for 'Delirio'. - Could not find any tags for 'Popeye El Marinero'. those error message look like either you were offline when you analyzed or beaTunes was blocked by your firewall. That aside: Did any BPM appear? Also, can you please send me your logs? http://help.beatunes.com/kb/troubleshooting/where-are-the-beatunes-... explains how. Hello I have just bought Beatunes and started analysing songs. I have noticed though that the BPM is giving me are totally wrong, some are half of what it should be. please don't hijack unrelated discussions. That said, double and half errors are so called octave-errors. They happen for two reasons: For some songs, even humans tap at different tempi when asked to tap a long to a song. This happens because sometimes we choose to tap at different metrical levels. Algorithms often have the same problem, especially when the track contains a lot of eighths, which look like double-tempo. Octave errors may happen for some genres more than others.